Don't you love how school starts and then everyone in the house gets sick? Well, that has been my week so far. My oldest started school last Monday and this morning we all woke-up sick. Love how that works. In order to make myself feel better I baked blueberry biscuits for dinner. They did make me feel better, so I say my cooking medicine must work. Growing up whenever I got sick my mom would cook and bake whatever I wanted. This was especially great when I started to feel better and I was allowed to eat brownies for breakfast to get me to eat. Granted most of the time I hadn't eaten for days and my mom was just trying to get me to eat something regardless of if it was healthy. I just remember lots of ice cream breakfasts, which were pretty great. Today my son ate nothing all day until I baked blueberry biscuits. I sat there watching him eat and thought of my mom and ice cream for breakfast. I love how food can evoke such powerful memories. Before I got sick last week I made another recipe which I think of in relation to my mom, coffeecake. She loved baking and eating pretty much any variety of coffeecake, so I was interested when Better Homes and Gardens had a recipe for Lemon-Raspberry Coffeecake in the April issue. This recipe has 13 ingredients. It takes 60 minutes of total time (plus cooling), 15 minutes of which is active and makes 10 servings. I had no problems finding any of the ingredients, most of them I already had in my pantry cupboard. For the raspberries I used fresh since they were easy to find and I prefer them to frozen when they are in season. I am horrible about remembering to set out my cream cheese to soften so I take the easy way out and zap it in the microwave for a couple of seconds. I did not put parchment on the bottom of my pan like the recipe suggested. I know every baker but me swears by this method. I prefer to just use baking spray and I have never had a problem with any baked goods not coming out of the pan. My total baking time was slightly longer than the 30 minutes suggested by the recipe. I also turned my pan halfway through the baking time. Finally, I chose not to top the cake with powdered sugar, I thought it was great the way that it was. I followed the remainder of the recipe as written. I was very pleased by how great this coffeecake came out looking. It was beautiful and it tasted just as great. Even my husband who doesn't like cake had a slice, which is saying a lot. I really like that the coffeecake has a nice taste from the cream cheese without being too rich or sweet. The raspberries are sweet and provide a nice taste and texture to the recipe. Overall, a recipe that I would definitely make again. 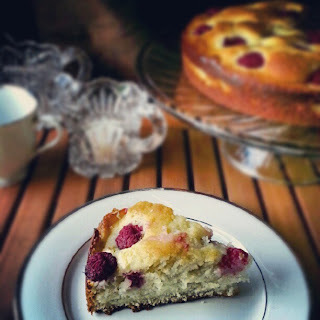 For the recipe go to Lemon-Raspberry Coffeecake. that looks amazing! i'm going to have to check out the recipe for sure! I have to confess this looks delicious. I may have to add it to my collection. Thank you for stopping by my blog. I'm a follower. Looking forward to more chats and recipes. Thanks :) Come back and visit again, I love finding new bloggers! Thanks :) I really loved the cream cheese in it, yum! Thank you for your comment on my blog! I can only pray that the Lord continues to give me the strength to praise Him through every storm! I look forward to following you! Thanks it was very yummy :) Come back again soon! This coffee cake looks yummy! Thanks for the sweet comment :) Thanks for hosting as always!